RVB: 00:00:03.521 Hello, everyone. My name is Rik, Rik van Bruggen from Neo4j and here I am recording another Neo4j Graphistania podcast. And today I've got someone from the UK on the other side of this Skype call, and I hope he's going to be able to hear me because we've had some technical problems before, and that person is Philip Garnett from the University of York. Hi, Philip. RVB: 00:00:28.167 Hey. Thank you for making the time, and thank you for being here, and let's hope that we don't have the glitches that we had before. Right? PG: 00:00:35.237 Yeah. Let's hope so [laughter]. RVB: 00:00:37.670 Hey, Philip, thank you for coming online and I'm so happy to have you here because I was reading the material that you just published a little bit earlier on some really fascinating research that you are doing or-- research, maybe I shouldn't call it that way. We'll talk about that more. But before we do you might want to introduce yourself to our listeners? Who are you and what are you doing? What's your relationship to the wonderful world of graphs? PG: 00:01:08.259 So yeah, my name's Philip Garnett and I'm an academic at the University of York in the School of Management. But I'm also affiliated to something that's called the York Centre for Cross-disciplinary Systems Analysis, which is where there's a lot of kind of complex analysis and network analysis done. In my day job, I suppose, I do a lot of mapping of organisational networks, sort of how organisations interact with people. And also I'm quite interested in mapping the relationships between data sets so how different parts of the data set would link together. So that's how I kind of got into the wonderful world of graphs and network databases. RVB: 00:01:54.022 Oh, wow. Wow. When you say complex systems what does that mean? Is that like organisational structures? How people organise themselves within a big corporation, for example? Or what does that mean? PG: 00:02:06.930 Yeah, it can be. So that would be how I would kind of interface with the field of complex systems. So you could think of it as a way of breaking an organisation down into parts and it's a way of analysing how those parts interact to sort of allow you to analyse the system behaviour as a whole. But it's actually, historically complex systems theory comes more out of biology, really, and it was a way of looking at how biological systems are sort of formed from relationships between the different parts. RVB: 00:02:46.026 Oh, wow. I didn't know that. But I guess the mapping to modern-day organisations is quite a good fit for network theory and network databases or graph databases because organisations have sort of morphed into network structures in the past couple of decades. Right? They're no longer hierarchical, they're more network-centric. Is that your experience as well? PG: 00:03:10.558 Yeah. That's right. Yeah. I think the sort of organisational complexity has definitely increased. I mean, not just in terms of they're no longer really hierarchical, but they're also sort of multi-sited, multi-divisioned, spread out all over the place. So if you can kind of use complexity theory as a way of understanding them as interacting parts, that helps. That helps with sort of trying to work out how they function. And things like how information flows across organisations and within organisations and can be mapped using networks and network analysis, yeah. RVB: 00:03:48.581 Wow. But that's your day job. From reading your blog posts I understood that you're a fan of podcasts, more specifically the Untold podcast as well? Tell us more about that. PG: 00:04:01.343 Yeah. That's right [laughter]. Yeah. So I suppose this is where the kind of day job leaks into the sort of social time or something. Yeah. So yeah. I got really interested in sort of podcasts about essentially unsolved mysteries or murders, in this case. And I came across Untold, which is a podcast and an associated book actually, which is sort of important - that's a bit later - about the Daniel Morgan murder investigation which-- Daniel Morgan was murdered in the 1980s. So do you want me to sort of go into how networks got involved in my reading of that book essentially or--? RVB: 00:04:46.597 I think that will be great. Yeah. Because my next question is going to be why did you get into this stuff? [laughter] Right? So why are networks in-- why are graphs interesting and important to you? That's my next question so. PG: 00:05:01.536 Sure. So I recommend that interested listeners check out the Untold podcast. And what they will very quickly realise is that there are a lot of organisations, but even more people, that are involved in this sort of decades-long investigation into Daniel Morgan's murder. And as I was reading the book and listening to the podcast, I sort of very quickly got essentially quite confused about all of the people and how they interacted, and the organisations that they interacted with. And then so being a sort of networks geek, I suppose, it seems obvious to me that the solution would be to produce a network database using Neo4j that would allow me to map all of the individuals and how they were related to each other, to help me-- essentially to follow what the story was about. Yeah. RVB: 00:06:00.760 Wow. That's fantastic. And did you find any interesting insights or was it more like keeping track of things? Or what did you find out while you were doing that? PG: 00:06:11.026 Well, yeah. So I was obviously never expecting to solve the crime. I mean, that's obviously not plausible. But I think for me-- and this is where it sort of turned into what essentially was a sort of bit of fun really or a way of helping me follow the story but is now kind of turning into almost a sort of research project in its own right. I think it's become very interesting to look at how closely connected aspects of the London Metropolitan Police are with the different press organisations. And sort of it would appear, although I haven't quite finished mapping the entire story yet, but there would appear to be quite significant links with the sort of politics as well, either via political organisations or people. And I think that's an interesting story in itself, the kind of overlapping interaction between these three areas. I mean, it's interesting in terms of today but also it's interesting to see how significant that was in the context of this case, yeah. PG: 00:07:47.969 Yeah. That's right. RVB: 00:07:48.470 --or the Bataclan network in Paris. And if you basically represent the same data as a list it will be difficult to find stuff out or follow it but if you represent it as a network you all of a sudden start to understand new things, I guess. Fascinating, right? PG: 00:08:10.753 Yeah. That's right. I think just reading off lists of names and who they met and in what context they met, you don't really get a sense of I guess what you could call the bigger picture, really. But as soon as you start mapping it as a network, you can start picking out significant individuals who seem to be connecting different organisations or people together or just highly connected in the context of this story. And the other thing that this story actually links to quite significantly in the UK is the Leveson inquiry into press standards, which is another research project that I've been quite interested in. So there's quite a-- and that was looking at the role of the press and the interaction between the press and the police and the sort of passing of information between the two. Some not so legal. Yeah. So it's really interesting that when you visualise something as a network, you can kind of pick out significant actors or organisations in that story. RVB: 00:09:19.336 Fascinating. Yeah. I mean, I think the link between those three items, right? I mean, a criminal offence, the press, the politicians. Such a current theme isn't it? It's really very actual right now. PG: 00:09:37.346 Yeah. That's right. Yeah. PG: 00:09:39.740 Yep. For sure. RVB: 00:09:40.544 So any future plans on this research, Phillip? Are you doing anything more? PG: 00:09:47.574 Yeah. I do now, actually, yeah. I mean, like I said, I mean, it started off as a sort of personal interest, but I think-- I mean, the first thing I'm going to do is obviously to finish the rest of the mapping. But I think drawing out those links between this as a sort of specific example of where a case has brought together politicians, press, and the police is very interesting, to put that in the context of the wider debate around the Leveson inquiry in the UK. But there is actually another story that I'm kind of interested in now that has some links, I think, and that's the Stephen Lawrence inquiry and the Stephen Lawrence murder in the UK. Because I think there's an overlap between some of the actors - particularly in the police but also perhaps in the political world as well - between this Daniel Morgan story and the Stephen Lawrence story. So I think it would be quite good fun perhaps in the sort of dark evenings over winter it might be nice to draw those two cases together, and essentially, look at what the network can say about how they're linked. RVB: 00:10:56.603 That would be amazing. But before you know it, you'll be drawn into it, and you'll be a private investigator yourself [laughter]. PG: 00:11:03.464 Yeah. Possibly. Or my other worry is where will it end? PG: 00:11:10.051 I mean, once you start unpicking these relationships, it's like, well, I imagine there'll be other stories that will be linked. So I could end up building an enormous network database, which would be very interesting to look at, actually. Yeah. RVB: 00:11:23.791 Yeah. Yeah. Absolutely. But that may mean that [laughter] your day job might suffer. And I don't know if you've got any interesting plans for the future in your day job as well, using networks, using Neo4j, or is that-- how do you see the future there, Phillip? PG: 00:11:38.749 Yeah. So I use Neo4j quite extensively in the day job. Well, I actually intend to potentially write some research papers on this, but in other domains, we use Neo4j to map the relationship between things like companies and their directors. So we've done that for the British banking sector. So we've mapped the banks, the relationships between the banks. Often by the people who sit on their boards. So a bank would often have multiple directors, and then some of those directors would sit on multiple banks. And then, what we've also done is extended that into looking at the relationship between banks and essentially what is usually called the real economy, which is something that isn't banking. So that's another interesting use case of Neo4j in my research. RVB: 00:12:34.279 Absolutely. Wow. And how do you see-- any thoughts on how this might evolve in the broader data industry? I'm sure you use other data tools yourself as well. 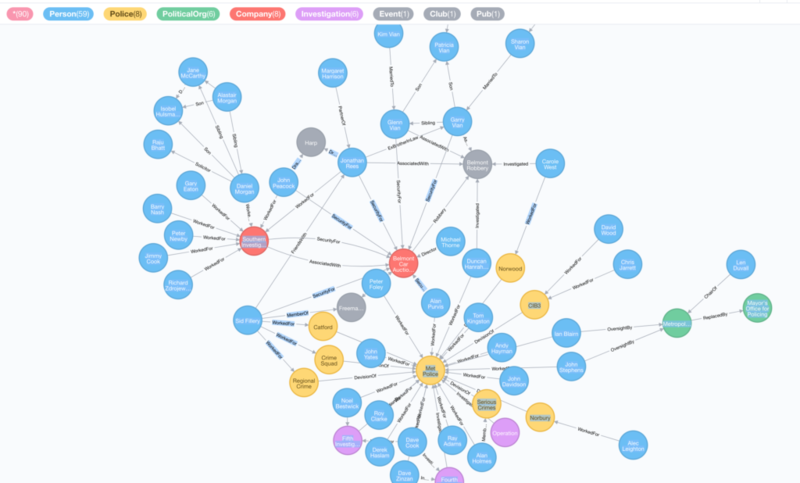 How do you look at graph databases in that context? PG: 00:12:52.193 So I think one of the areas that I'm quite interested in is looking at how-- and I think there's quite a lot of work done in Neo4j in this-- is how you can link things like document databases to store large amounts of data with then something like Neo4j to help you map and analyse the relationships between that data. And we do that already with MongoDB and Neo4j. But one of the kind of more longer-term projects I'm interested in is ways of using machine learning and algorithms to build the links between the data automatically, or at least semi-automatically. So that's the kind of long-term future goal. So rather than me spending hours in the evenings typing in all the data manually, it would be nice to do a lot of that automatically, if we can, with machine learning. So that's a sort of more long-term aim. RVB: 00:14:01.285 We've seen quite a bit of take-up on that with people like the ICIJ, right, doing the Panama Papers and the Paradise Papers. But also, some of our partners like GraphAware are doing these really cool natural-language processing projects on top of Neo4j. Creating knowledge graphs semi-automatically, right? So. PG: 00:14:25.353 --the more of that that we see, the better, really. RVB: 00:14:29.135 Very much so. PG: 00:14:29.664 So it's a really exciting area of research. Yeah. RVB: 00:14:32.037 Phillip, I want to wrap up because as you know I try to keep these podcasts nice and succinct, and I will publish lots of links to your blog post and hopefully, maybe also some of your other research in the transcription of the podcast. But I want to thank you so much for spending some time with me tonight and recording this. It's been a pleasure talking to you, and I hope to see you sometime at GraphConnect or another event that we might organise. PG: 00:15:01.646 That would be fantastic. Yeah. Thank you very much. It's been really good fun. Thank you. RVB: 00:15:05.243 Thank you. Thank you, Phillip. Have a nice evening.